We have deployed apps both on the public Google Play and Apple App stores, and internally for private company use. We know what it takes to build robust and reliable apps that keep your users engaged. Our apps are always tailored to meet the exact needs of their users. Whether those needs include flashy animations, complex offline functionality, or native feature interaction, HELLO PEOPLE has the experience you need to make it happen. HELLO PEOPLE provides mobile app development services to businesses in Melbourne. You could be an inventor who wants to convert your idea into a mobile app, a business who wants to automate a task or enhance customer services by using mobile technologies, or another software solution provider who wants to develop an integration to a mobile app. We have developed mobile apps for a variety of clients, from individuals to businesses and start-ups to corporates. requirements gathering to ensure all aspects of the ‘idea’ is captured, and deliverables are understood. provide advisory services on improvements, enhancements and alternate approaches to development. ensure the solution is within the budget, and if not, to re-engineer the solution to deliver within the budget with a minimum impact to the requirements and deliverables. develop a cross-platform solution on time, and on budget. provide unit and functional testing. facilitate user acceptance testing (UAT) for mobile apps. provide mobile app integration services. provide mobile app marketing and support services. What are the benefits of a mobile app? A mobile app can be a business model on its own. The famous apps SnapChat and Uber are good examples of apps that have resulted in two billion dollar businesses. In both cases there wasn’t a pre-existing business prior to the app. The business was created to operate the app and for statutory and legal reasons. In the context of an app-centric business, the overall benefit of a mobile app is the business as a whole. The value of the business is the value of the mobile app itself. App-centric businesses are a new business model that emerged with Facebook and Twitter. The valuation of Facebook was in billions at a time when there was no income stream or a method to calculate the return on investment. Business-driven apps are designed and developed for an existing business. The key benefits that a business will gain by developing a mobile app can be summarised into the below categories. Increase efficiencies in an existing business process. 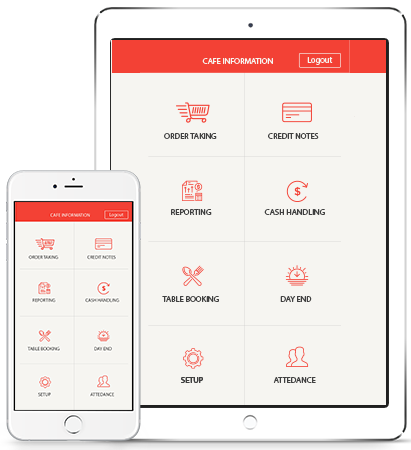 For example, an order-taking app helps businesses to receive an order in an efficient manner by auto-printing the order directly to a printer. Improve customer service. For example, offering online ordering. As a sales and marketing tool. For example, the use of push notifications to inform customers of special promotions, or one click incident tracking and reporting related to health and safety. Design starts with a conversation to understand your objectives and ideas. You will talk directly with our mobile app solution architect who has over 20 years experience in business with a broad range of technologies. The ideas are documented and presented in a visual and written format. The design phase ensures the mobile apps we deliver are exactly what your business needs. Our developers live and breathe technology. Our team of mobile app developers are experts in both the look and feel design (user interfaces), and functional development (user experience). We have a proven track record of developing mobile app solutions. The development phase ensures the mobile apps we deliver will meet the design specifications. A mobile app, like any other software, requires support and maintenance. The development does not mean our engagement with your company is over and we walk away. We offer ongoing support and maintenance services that will keep your business moving smoothly for years to come. The support phase ensures your customers are happy with the apps and they are up-to-date. Ever since the introduction of Apple's innovative iPhone in 2007, Apple has been a trendsetter in the device market with its iOS mobile operating system. By the same token, our app development team has been building iOS apps since the first developers’ beta iPhone OS SDK released in 2008. Over the past years iOS application development has been a top priority for us as the most appropriate platform for corporate app creation as well as the cornerstone of user-friendly bespoke application development for the B2C segment. Our in-depth knowledge of both software development and mobile marketing strategies allow us to carry your project through all stages from the initial idea to design from to a successful launch in the App Store. Android OS is the perfect platform for businesses reaching out to the largest pool of end users. Android app development is a challenging task for any software development professional due to the variety of smartphone and tablet models, as well as screen sizes and resolutions that require rigorous testing to ensure the app’s performance across the pool of devices. Our architects and creative UI (user interface) designers have acquired a deep understanding of user behaviour and a great experience of app design to meet all of the demands and to provide you with a brilliant digital solution for the Android market. Here at HELLO PEOPLE you will meet ambitious people who are looking for new challenges of solving complicated tasks of web app development. We can tackle projects of any scale and complexity and have enough expertise to integrate the client's software and hardware within a new web application created by our web app developers from scratch. We are experienced in third-party code audit and can finalise any job, which has failed to be completed by other third-party developers or has taken too much of your in-house team’s time. Our expertise covers such programming languages as Java, JS, PHP, C#, C++, SWIFT, Python, Shell, Ruby, Objective-C and many others. We also utilize a wide variety of frameworks that help us to deliver quality projects within the shortest time. Windows 10 Mobile was released in January 2015, as a mobile operating system for smartphones and tablets. This operating system is focused on unification with Windows 10 for PCs in services and applications. It is still a continuation of the Windows Phone OS, and all Windows Phone devices can be upgraded to the platform. Software for Windows 10 Mobile, created with the Universal Windows Platform, allows developers to design applications for multiple product families running Windows 10, with nearly identical functionality.